We are a IHR e.V. German registered breeder and our Yorkshire's are called "Biewer Yorkshire Terriers" in honor of Mr. & Mrs. Biewer and carry their founder prefix in the name, examples: BIRO-Birgit Rösner & Roberto Krah and Biewer-Gertrude & Werner Biewer, for the Golddust-Kristen Meyer-Sanchez is the founder and Sharon Brown introduced the Golddust to the US and the most recent, is the Ocean Pearl that was discovered in Europe, though the founder is unknown. Each one of these breeders wanted to have their dogs established and thru their dedication and breeding efforts these dogs were named after their founders. 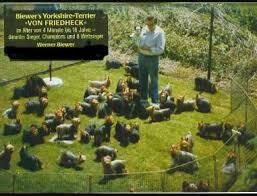 Where did the Biewer Yorkshire Terrier come from? In the 1970's Mr. Biewer purchased a lot of dogs from the Streamglen Kennel in Germany and Streamglen Richard born 10/06/1972 and Streamglen Flora were two of them. Streamglen Richard was a consistent championship show winner and most of Mr. Biewer's dogs were bred from Streamglen Richard, which is the foundation of what is known as the Biewer Yorkshire a la Pom-Pon. 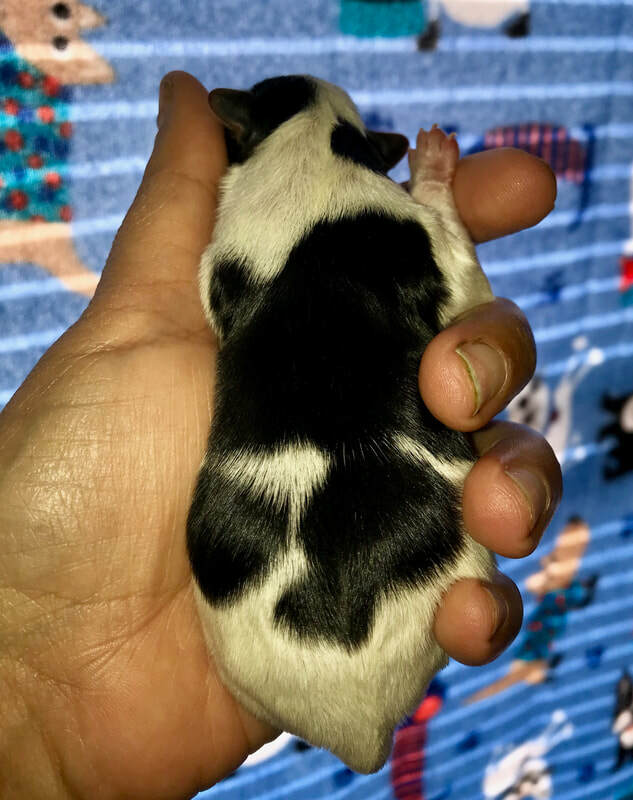 In order to get the Tri-color (three colors), a recessive piebald gene was present in both dogs, combined making this a dominant gene. Mr. Biewer's first tricolored Biewer Yorkshire Terrier was born from two traditional (blue and tan) champion Yorkshire Terrier's. It was in Hunsruck, Germany in 1975, a man named, Werner Biewer purchased a Champion Yorkshire Terrier from Streamglen Kennels, “Streamglen Richard”. Werner and his wife Gertrude had been raising and showing Yorkshire terriers for 20 years and Mr. Biewer wanted to make his mark by producing Champion status Yorkshire Terrier’s. Through selective breeding over the next several years, the couple continued to produce the signature headpiece with all three colors, black-white-gold with good symmetry. Their belly, chest, legs and tip of the tail were characteristically white and their hair was straight, silky and long. 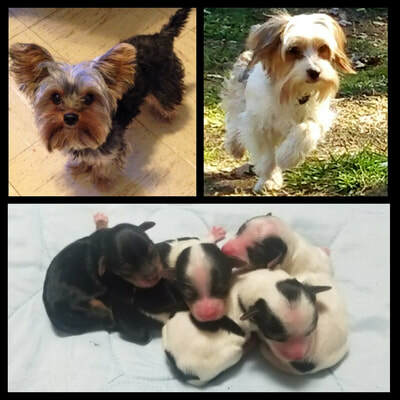 In the beginning of their breeding practices, the Biewer’s would dock the tails of these dogs just as they had done for years with their Yorkshire’s and it wasn’t until May of 1998 when Germany passed a law prohibiting the docking of tails, when the Biewer’s left the tails natural. 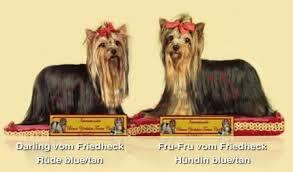 Mr. Werner discovered as some of their tri-colored dogs matured the black color in the coat would turn to a dark blue. Two Biewer Yorkshire Terrier parents will always produce Biewer puppies. Mr. Biewer wanted to show his new found tricolored dogs and first introduced his tricolored dogs to the show ring in March of 1988 at Wiesbaden, Germany. He presented two dogs and called them black and white Yorkshire Terriers to, Verband fur das Deutsche Hundewesen (VDH), only to be denied acceptance and told they "were wrong color" and "not for breeding." 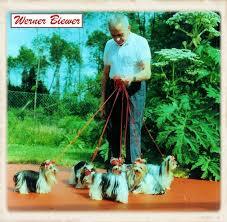 Mr. Biewer was not happy with that decision and went in search for a Club that would accept his tricolored dogs. It was while at a dinner party with a close friend of theirs, a singer by the name, Margot Eskens and her husband. Mr. Esken presented Margot with one of Werner Biewer's tricolored puppies on a silver platter and in Mrs. Esken’s delight she shouted out, “a la Pom Pon” (French) describing the puppy as looking like a “ball of colorful yarn,” (translated to English) which described the puppy perfectly. Mr. and Mrs. Biewer liked Margot’s description so much that they decided to name their tricolored dogs, “Biewer Yorkshire a la Pom-Pon’s”. 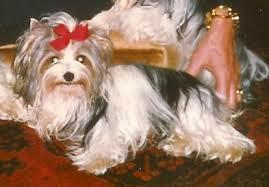 Sometime in (1989) Mr. Biewer found a club, the first club, Allgemeiner Club der Hundefreunde Deutschland e.V (ACH), to accept his tricolored dogs as a variation of the Yorkshire terrier but with a different standard then the Yorkshire. By doing this, what Werner Biewer did was get his tricolored dogs to be acknowledged as "a new distinct breed". So, Mr. and Mrs. Biewer drew up a very limited standard for these little dogs and officially registered them as “Biewer Yorkshire a la Pom-Pon” to be a color of white-blue-gold. 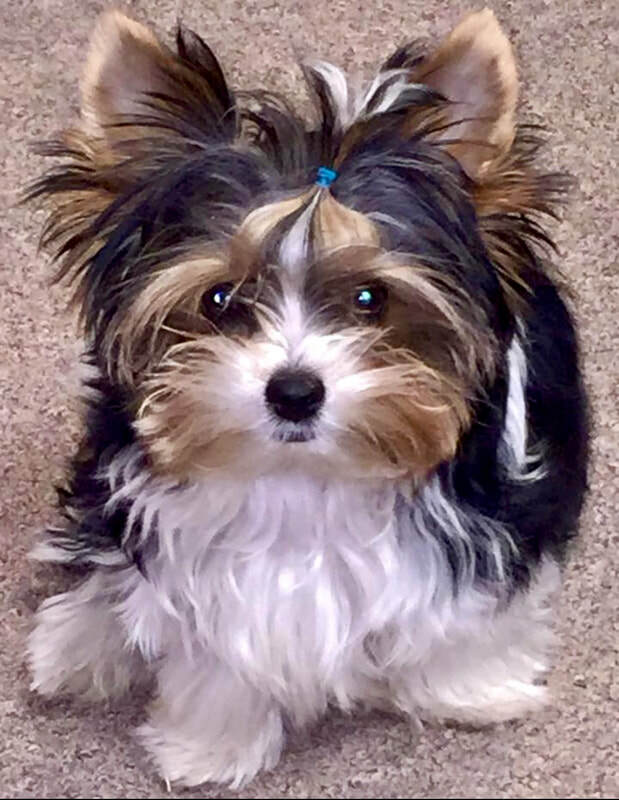 *It was recorded that the Biewer Yorkshire Terrier was acknowledged as a new distinctive separate breed in Germany in 1989* Why have I highlighted this information you might ask?I have highlighted this important date because: If and when a breed is already acknowledged then that breed should be acknowledged World Wide! 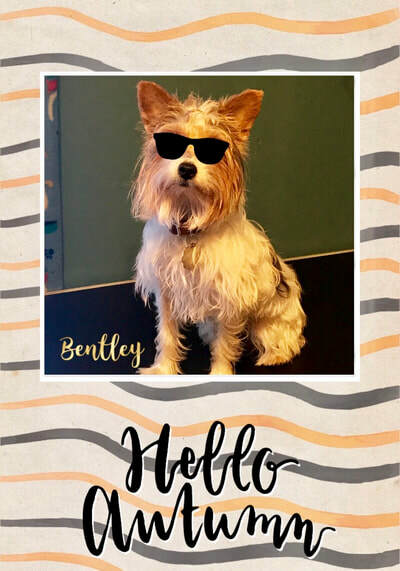 Meaning: the "Biewer" was already acknowledged as a separate breed from the Yorkshire Terrier by Mr. and Mrs. Werner Biewer by introducing their dog as a variation of the Yorkshire Terrier with a "NEW Breed Standard" in 1989 in Germany. So, because of that very historical fact, then there is only one "Biewer" and that name goes to the Biewer Yorkshire Terrier! 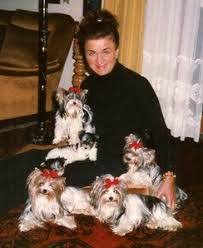 Other breeders were intrigued with the Biewer Yorkshire a la Pom-Pon and began breeding them as well. Mr. and Mrs. Biewer kept a tight reign on the Biewer Yorkshire a la Pom-Pon breeding programs in Germany and their quality-bred dogs were hard to come by and quite costly to acquire. But, then in 1997 Mr. Biewer passed away and sadly after Werner’s death, Gertrude kept just a few of their Biewer Yorkshire a la Pom-Pon’s as pets and their Friedheck Kennel ceased to exist. After Werner's untimely death, many breeders started their own attempts to create the perfect Biewer Yorkshire a la Pom-Pon and we will never know what breeds were bred to create the Biewer outside of: Mr. & Mrs. Biewer's Biewer Yorkshire a la Pom-Pon's and by the year 2000 the Biewer Yorkshire a la Pom-Pon had lost its popularity in Germany, with the number of breeders had dwindled significantly. Then on May 23, 2003 a dog fancier that knew Mr. and Mrs. Biewer by the name of Dagmar Pryzstaw opened the 1st Deutsche Biewer Club (IBYTC) and in September 2004 opened another Biewer Club, the International Biewer Club (IBC) in Germany. 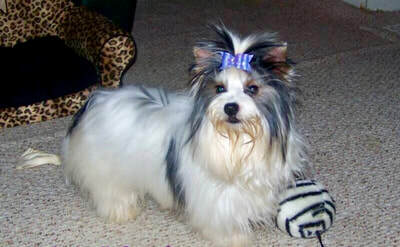 On November 02, 2007, Gertrude Biewer changed the Standard of the Biewer Yorkshire a la Pom-Pon by the recommendation of the German Club ACH to be called the "Biewer Yorkshire Terrier." Then on October 10, 2012 after a lengthy illness Gertrude Biewer passed away and all that is left of Werner and Gertrude Biewer is a beautiful legacy, the "Biewer Yorkshire Terrier." It has been said by some of the American Biewer Clubs that Mr. Biewer never bred back to the traditional Yorkie, which is a myth. 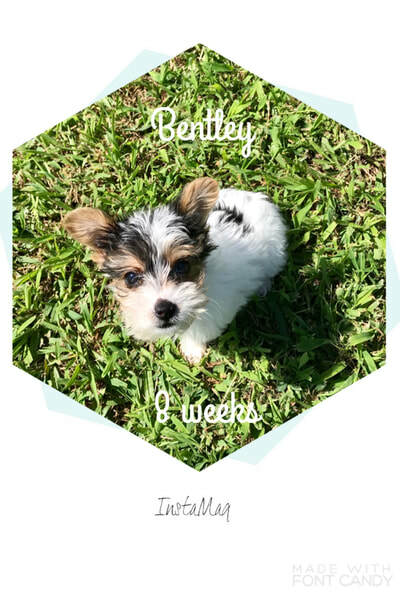 ​There are breeders of the "Biewer" that state they only breed Biewer to Biewer but, where the breed originated in Germany those breeders feel that they don't have enough lines of the Biewer Yorkshire Terrier breed, to only breed Biewer to Biewer, and they breed back to the Yorkshire Terrier to further and continue to strengthen the breed. 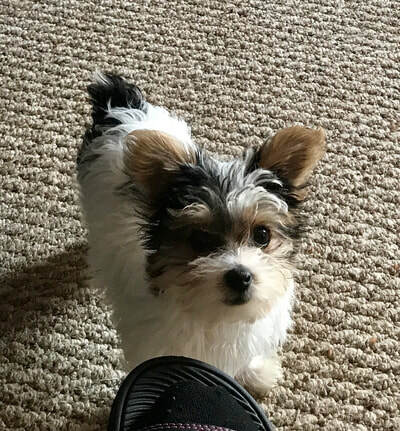 So, if the Germans, where this Biewer Yorkshire Terrier originated from feel they don't have enough lines then, "How do American breeders feel they have enough lines?" The Biewer Yorkshire Terrier has only been in existence since 1984. 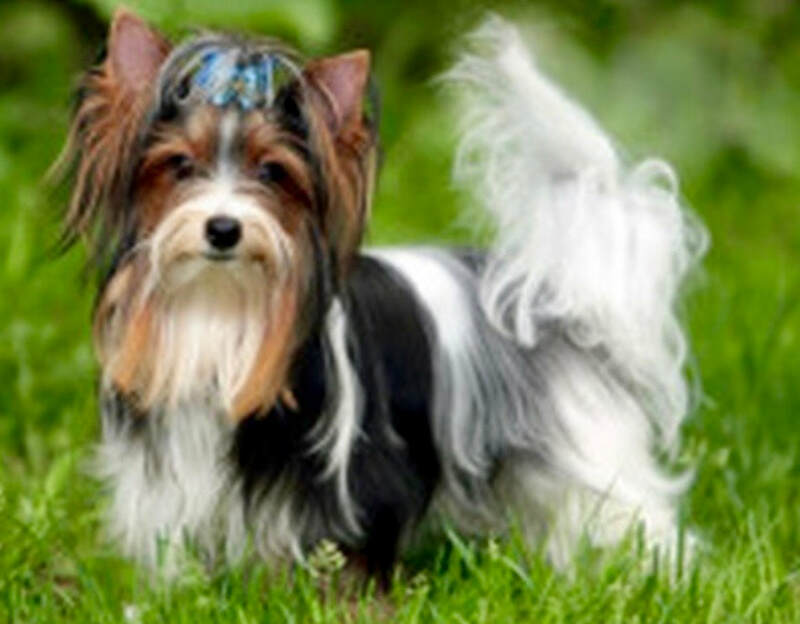 The "Biewer" has been quite the most debated breed so far in history to come and if you google Biewer you will find they have different acronyms, Biewer, Biewer Yorkshire Terrier, Biewer Terrier, Biewer Breed etc., not to mention even differentiated accounts on how this Yorkshire Terrier now considered a separate breed originated. But, one thing is certain: the Biewer Yorkshire Terrier originated in Germany and the Parti Yorkshire Terrier originated in America. 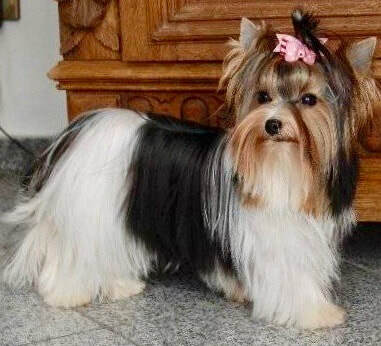 The Biewer Yorkshire Terrier is recognized here in the US with the CKC, BBGC, BBIR, ACA and with the AKC as a Parti Yorkshire Terrier and in Germany the Biewer Yorkshire Terrier is recognized with the IHR e.V., IBC, ACH e.V., NHC, and ACH-L.
General Appearance: the smallest terrier that owns a long rich coat thats parted on the back. Head: small and flat, by no means round or strongly formed, short catch, deep black nose, eyes medium and dark with intelligent expression, small ears, V-shaped, standing with short, full hair, hair on head and chin. Hull: very compact with straight backline, well-formed loin. Limbs: completely straight, very luxuriant, covered with hair, paws round. Tail: undocked, abundantly hairy, worn slightly higher than the backline. Hair: medium length on the body, smooth, silky and shiny. Outer Coat: blue/white, broken or closed, blue/black with white frill, no gold (tan) in top coat. Legs: legs, and belly and chest hair white. 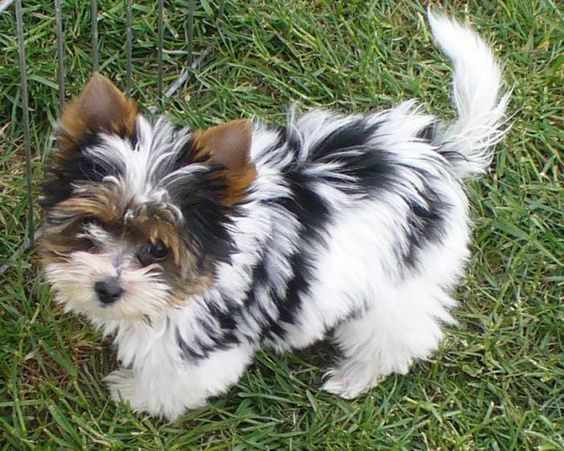 The Biewer Yorkshire Terrier must have 3 colors: blue or black/white/gold. The dog must have a white neck (brace). The white breast color is of coarse as well as the 4 white legs. The white color of the chest goes down to the neck, also white to the chin. In preface, the white color is not necessary. The face color should be set of dark with tan. Size: up to 22 cm. Weight: about 3.1 Kg. 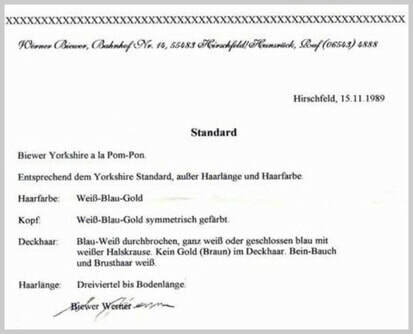 The last German Standard that Gertrude Werner created and signed for the Biewer Yorkshire Terrier. 02.11.2007 (02 November 2007). 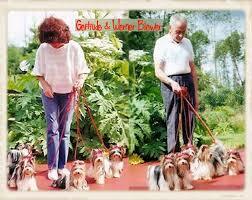 Mr. & Mrs. Biewer's "Biewer Yorkshire Terrier's"
Left: Mr. Werner Biewer with Schneeprinz von Friedheck. Middle: Dagmar Przystaw with Sissi, (offspring from Friedheck). These examples of Biewer are not our dogs.